Perhaps a pancake breakfast is a Sunday tradition in your house, or whipping up a batch was a spur-of-the-moment decision. The fluffy flapjacks aren't a problem if you have all of the ingredients. But what if you are out of maple syrup? 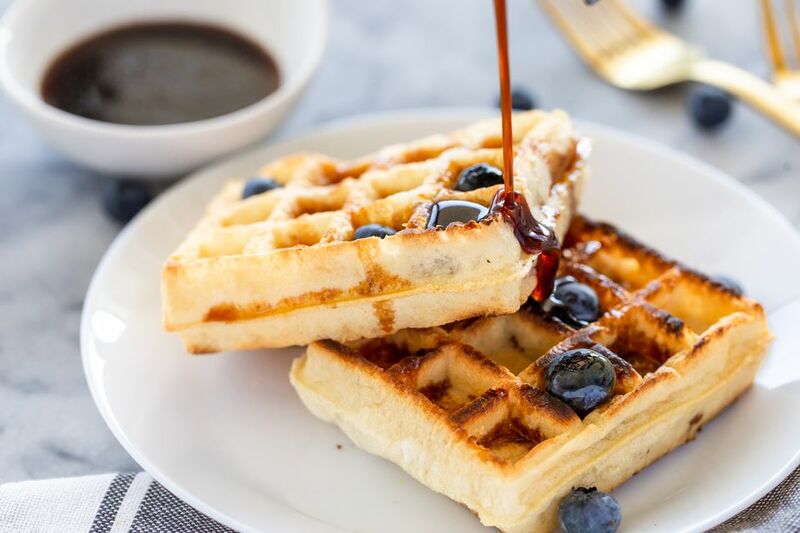 While nothing can really replace the flavor of pure maple syrup, you can turn some pantry staples into a tasty and less expensive substitute to use as a topping for pancakes, waffles, and French toast. One reason it is a challenge to recreate the taste of maple syrup is that it is a natural substance that is simply cooked down. Maple syrup starts as the sap of maple trees and boiling after the harvest concentrates the sweetness and thickens it to the syrupy consistency. Tapping the trees takes place by hand during a few months in the late winter/early spring. The labor-intensive process partly accounts for the high price of pure maple syrup. In addition, it takes about 40 gallons of sap to make a gallon of maple syrup. This maple syrup substitute recipe results in a loose caramel sauce flavored with maple extract. While it can't stand in for maple syrup in baked goods, it does make a fine breakfast syrup. Spread the granulated sugar in an even layer in a heavy skillet. Cook it over medium heat until it starts to melt and turn brown. Slowly swirl the pan or use a silicone or wooden spatula to gently fold the liquifying sugar from the edges into itself in the center. Pull the pan off the heat as soon as the sugar becomes an amber liquid. Add the brown sugar to a heavy saucepan. Pour the boiling water over it and let it dissolve without stirring. Add the caramelized white sugar to the melted brown sugar in the saucepan. Simmer, stirring frequently until the mixture thickens to syrup consistency. Remove the pan from the heat and whisk in the butter and maple or vanilla extract. Store in a sealable container or serve immediately with pancakes, waffles, or French toast. Although this is a basic recipe, there are a few things to keep in mind when caramelizing the sugar. You need to watch the caramelizing sugar carefully because it can go from desirably browned to irretrievably burned in a matter of seconds. You should also wear oven mitts when you work with boiling sugar to avoid especially painful burns. Homemade maple syrup can be stored in the refrigerator for up to two weeks. Before serving, warm the sauce to room temperature (or more) as it will be too thick to pour straight from the refrigerator. Maple syrup isn't the only topping for breakfast treats. There are other delicious ways to create a syrup to drizzle over pancakes, waffles, or French toast. Take your family's favorite jam or jelly and cook it down with a little bit of water until it is a smooth consistency. You can follow the same procedure with fruit juice (without adding water), and gently cook the liquid until it becomes thick. If you have fresh or frozen fruit on hand, put a handful in a saucepan with a bit of sugar and water and cook, stirring, until a syrup forms. For a decadent treat, pull out the Nutella or ice cream toppings like chocolate sauce, caramel, butterscotch topping, and whipped cream. In baking, maple syrup adds both sweetness and moisture to doughs and batters. Although you cannot use this substitute in place of maple syrup in baking recipes, you can make some adjustments to your baked good recipe to mimic the taste and effects of maple syrup. You will need to increase the sugar to 1 cup for every 3/4 cup of maple syrup called for in the recipe, and add an extra 3 tablespoons of liquid for each cup of sugar you end up using. Baking soda should be decreased by 1/4 teaspoon for each cup of sugar as well, as it's less acidic than maple syrup. Honey, molasses, agave nectar, and corn syrup can all be substituted (1 for 1) for maple syrup in recipes, though each adds a different flavor. What Can You Use as a Substitute for Alcohol in Cooking?